The fundraiser that rewards your participation with a tuition reduction & does not cost you an extra cent! Year round, ARCS sells Gift Cards! These are the same gift cards that are sold at retail stores! There are over 300 retailers to choose from. ARCS buys gift cards at a discount and sells them at face value. We split the discount between your ARCS tuition account and our operating budget. We have cards in stocks and hundreds of more brands and denominations are available by special order every other week. Please see the below Order Schedule link for specific order dates. A full list of the retailers is available at www.shopwithscrip.com or see the below link. Orders can be placed directly at www.shopwithscrip.com or you can send the order into the school with payment. Please see the below link “Start Shopping with Scrip” for how to get started. Please see the below links for detailed information on the ARCS Scrip Program. If you still have questions, please contact Samantha Guerro at momofbaseball@aol.com or 609-226-7645. Thank you for supporting our fundraiser! Assumption Regional Catholic School purchases gift certificates/cards from popular retailers (ShopRite, Wawa, Kohl’s, Walmart, Amazon, etc.) at a discount. Parents and school supporters then buy the gift certificates from the school at face value. The difference in the price is kept by the school. Parents then spend the Scrip through the card at the retailer, where it’s worth the full face value. As the consumer, you are not paying anything extra out-of-pocket, and the retailer is giving Assumption Regional Catholic School a percentage of your purchase (anywhere from 2% on up). 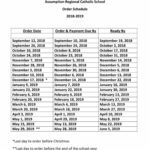 How does the Scrip Program work at Assumption Catholic School? You may order Scrip online by accessing www.shopwithscrip.com and send your payment to the school office. Click here for order and delivery dates (ARCS Scrip Order Schedule 2017-2018. Order forms are available in the school office, or you can email or call Samantha Guerro at momofbaseball@aol.com or 609-226-7645. with your order. A complete retailer list can be found at www.shopwithscrip.com. You may order Scrip for any retailer listed on that site. You may reload Scrip cards on your smart phone. It’s easy to receive Scrip on your phone! Now when you’re out and about and need to reload your Scrip cards, you can do it right from your phone.